Live From Uganda, It's Kanye West Making Some New Music! Kanye West has said he will construct a world class tourism school in Uganda which will be a foundation of tourism in the East African region. The 41-year-old internationally acclaimed American rapper made the remarks on Monday at State House Entebbe, where he had visited President Museveni. 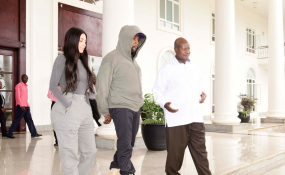 West and his wife, reality TV star Kim Kardashian held what President Museveni described as a 'fruitful discussions' about promoting Uganda's tourism and arts. The American rapper said he was happy being in Uganda describing it as his second home. A statement from State House noted that the American couple discussed with Mr Museveni issues related to investment potential in Uganda and Africa in general, especially in the areas of tourism, among other vast areas of interest. President Museveni welcomed the couple to Uganda saying the country is for all the people. "This is the source of human life, even the whites originally came from here," he said. Mr Museveni assured the couple of his support so that their potential is exploited to the maximum during their one week stay in Uganda in order to enhance the country's potential as the best tourism destination for Americans. He handed them Uganda's pictorial and tourism destination areas. The celebrity couple flew into the country last Friday and are currently at Chobe Safari Lodge in Murchison Falls National Park in north western Uganda. West and Kim were also new Ugandan names by the president. Mr Museveni named Kanye West Kanyesigye while his wife was baptised Kemigisha.